Odisha govt. has raised the social security allowance under the Madhu Babu Pension Yojana. Now the old age pension for all the senior citizens under MBPY is hiked which will come into effect from 15 February 2019. CM had made this announcement at a programme organized under Ama Gaon Ama Bikash campaign in Bhubaneshwar. Earlier in the month of December 2018, the state govt. of Odisha had decided to include 5 lakh new beneficiaries in Madhu Babu Pension Yojana under PEETHA (People Empowerment – Enabling Transparency and Accountability of Odisha initiatives) Scheme. This inclusion is going to ensure that not a single eligible person is left out under social security scheme benefits. Moreover, the state govt. has also hiked the social security allowance for all the beneficiaries who are receiving allowances under disabled and widow pension scheme. As per the official announcement, the new old age pension in Odisha has been revised to Rs. 500 from Rs. 300 for people b/w 60 to 79 years of age. Similar to this, people who are above 79 years of age would now get revised pension amount of Rs. 700 from previous Rs. 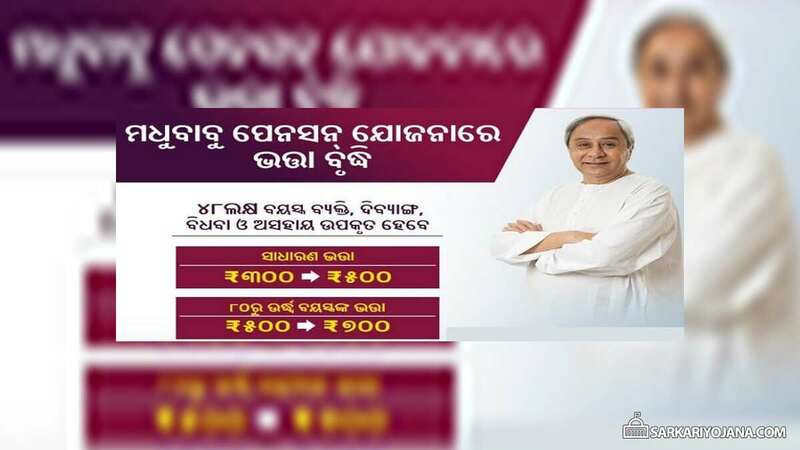 500 under Madhu Babu Pension Yojana in Odisha. In addition to this, the state govt. has also announced to hike allowance amount by Rs. 200 under Handicapped Pension Scheme and Widow Pension Scheme in Odisha. Around 48 lakh pension beneficiaries would be benefited by the hike in allowances which are going to be distributed under the sponsored social security scheme. This announcement of raising the pension amount under Madhu Babu Pension Yojana (MBPY) is an effort to attract people towards it. This decision of raising the amount under Old Age Pension, Disability Pension and Widow Pension Scheme is an effort to strengthen social security in the state. Around 48 lakh people would be benefited with this hike in the allowance under MBPY Scheme. Earlier in December 2018, the state govt. had included an additional 5 lakh beneficiaries in MBPY. CM has made this announcement during the weekly Ama Gaon Ama Bikash programme. All the bonafide beneficiaries of the state can reap the benefits of social security scheme.